Tested for Than 950 Contaminants! The human intestinal tract contains seven enzymes that split dietary disaccharides into free monosaccharides. Until now, commercially available enzyme products contained enzyme ingredients that had the activity of only some of these disaccharidase enzymes. One in particular, however, sucrase-isomaltase complex, was only partially represented in these products. Invertase is present in these products to hydrolyze sucrose to yield glucose and fructose, and to hydrolyze other complex sugars that contain fructose, so it acts as a sucrase enzyme. The isomaltase fraction of that human enzyme is not represented because there is no commercially available form of isomaltase in the world. This study provided the impetus for Kirkman to search for an enzyme that had isomaltase/palatinase activity. Kirkman found that enzyme and trademarked it Isogest. Isogest has the ability to split isomaltose into two molecules of glucose and to split palatinose into one molecule of glucose and one molecule of fructose. The result of including this new enzyme is better, more complete carbohydrate digestion. Currently, no other enzyme product can offer this added activity. 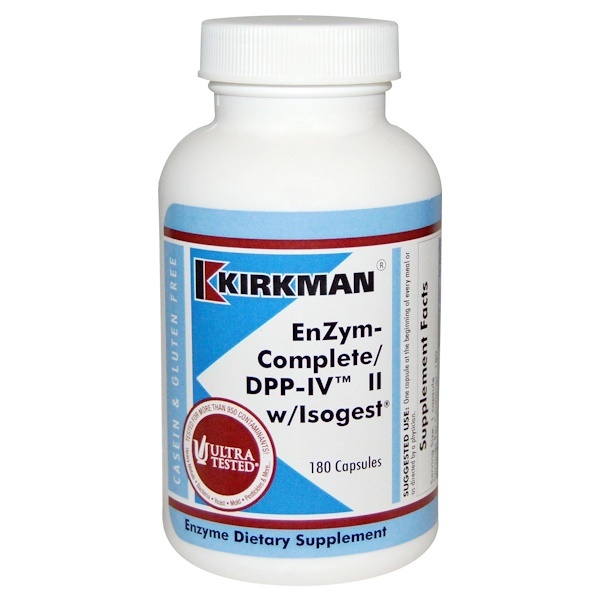 EnZym-Complete/DPP-IV II with Isogest is Kirkman’s second generation version of Enzym-Complete/DPPIV. It contains all the enzymes present in Enzym-Complete/DPPIV plus Isogest. 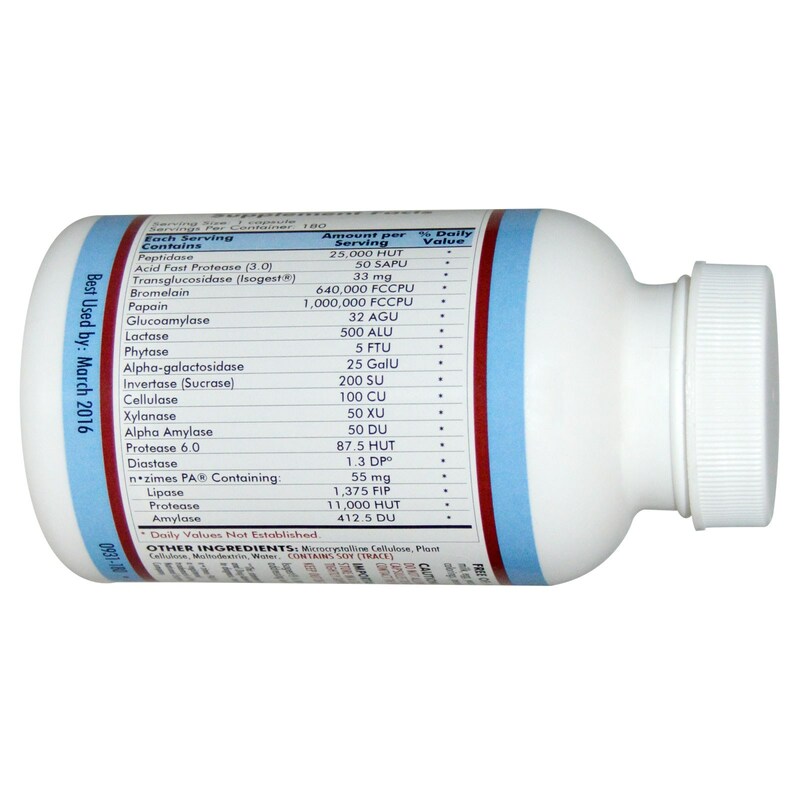 The presence of Isogest gives this product the equivalent activity of the isomaltase fraction of the sucrase/isomaltase enzyme found in the human digestive system. Individuals currently using Enzym-Complete/DPPIV who are getting partial results and still need some improvement or individuals using other enzymes who are not completely satisfied with the results should try EnZym-Complete/DPP-IV II with Isogest formula. No adverse effects were reported. One capsule at the beginning of every meal or as directed by a physician. Microcrystalline cellulose, plant cellulose, maltodextrin, water. Free of: Sugar, wheat, casein, gluten, milk, egg, yeast, gelatin, flavorings, colorings, peanuts, tree nuts or fish. Do not allow the powder in the capsules to get into the eye or contact the skin.